Ea O Ka Aina: Where is the Fukushima Data? Where is the Fukushima Data? SUBHEAD: Nuclear power plants must be shutdown while we have the resources. Soon we won't be able to afford to. Image above: This picture shows the damaged No. 3, left, and No. 4 reactors of Japan's Fukushima Daiichi power plant on 3/16/11. 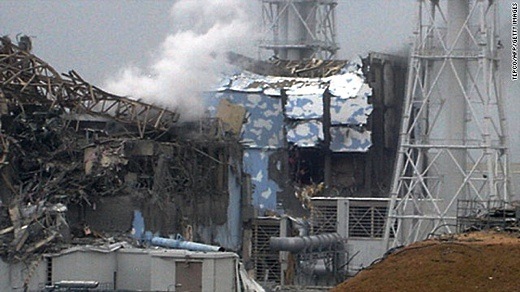 From (http://news.blogs.cnn.com/2011/03/16/glossary-for-fukushima-daiichi-crisis/). Let's look into a bit of background about the Fukushima Daiichi Nuclear Power Plant (FDNPP) disaster. I have included several reports from 4/19/15 stretching back to 4/9/11. Since late 2011 I have visited ENE News to see the latest in information concerning the aftermath of Fukushima. One thing that has been clear since 3/11/11 is that there has been a widespread coverup of information showing the planetary impact of the event. The Tokyo Electric Power Company (Tepco) and the Japanese government are dedicated to continuing nuclear power in Japan and have thwarted every effort to reveal the breadth and impact of the complete meltdown of three large nuclear reactors in a valley on the shore of the Pacific Ocean. Even today many mass media sources throughout the world characterize FDNPP disaster as merely the worst nuclear accident since 1989, when a reactor in the Ukraine at the Chernobyl nuclear power station exploded. The fact is that FDNPP is an order of magnitude worse that Chernobyl. At Fukushima there are six reactors and each has a fuel pool. There is also a common fuel pool with nearly as many fuel rods as all of the reactors. Four of the reactor buildings have been destroyed with three reactors completely melted through their containments. At Chernobyl the USSR quickly responded, sacrificing many of its people to contain the damaging radioactive materials. A sarcophagus containing the entire damaged reactor building was immediately planned and soon completed. A massive concrete barrier was also constructed under the molten core to isolate it from the environment. A large area of the Ukraine was put "off-limits". The loss of confidence and pride in Soviet technological excellence is thought to have led to the collapse of the USSR shortly afterward. Japan was not going to let that happen to them. Without any of their own energy sources to run the number two economy (now number three) in the world the Japanese are dependent on their use of nuclear power to run the Toyota, Mitsubishi, Toshiba plants throughout the country. Where did that nuclear technology come from? The United States... specifically at FDNPP it was the General Electric Boiling Water Nuclear Reactor technology. If that technology was discredited Japan would fail. It could not afford to run its 21st century industrial technology on imported fossil fuels. And so the coverup began at the very beginning of the disaster and continues. One important aspect of keeping the coverup intact is not measuring (or at least not reporting to measure) the spread of radioactivity from the shattered FDNPP throughout Japan, the Pacific Ocean, the United States and the world. You would think that the Japanese and American nuclear regulatory agencies, their respective environmental protection agencies, their military organizations and university systems would all have dove in and provided the personnel, funding, technology and equipment needed for extensive gathering of data on this planetary disaster. Not so. If you believe the spokespersons in Tokyo and Washington, no ongoing extensive information has been gathered over the last four years. But I don't believe that. I believe the information is not being shared with the public. Australian Broadcasting Company Tours Fukushima Plant: This could go on for centuries, and some say problems can never be fixed; “Tepco admits it doesn’t know extent of meltdowns” — Official: We don’t know ‘real situation’ of the molten fuel, “nobody has seen it”; We need help from the world. An effect of [the Fukushima] disaster was secondary formation of radioactive 35S… when neutrons… activated the coolant sea water. Here we report the first measurements of 35S [which oxidized to 35SO2, then 35SO42-] collected at six Japanese sampling sites… during March-September 2011. Even after 6 months, 35SO42- activity remains very high… in the Fukushima region, which implies that the reactor core was producing radioactive sulfur. 35S is a unique tracer in that it provides information on the number of neutrons emitted from the reactor core and can be used to probe the condition of the reactor core as well as the containment vessel. 35SO42- concentrations [of 61,000 atoms/m3 in Kashiwa (200 km from FDNPP) and 120,000 atoms/m3 in Kawamata (50 km from FDNPP)] are the highest 35S activities ever measured in any atmospheric sample and are nearly 100 times higher than the natural background. Figure 3 [right]: 35SO42- measured… at Fukushima prefecture… shows that, even after 6 months… the reactor core was active and producing 35S. The natural background 35SO42- concentration [is] 300 to 900 atoms/m3. Even after 6 months, 35S activity was very high… which implies that the reactor core was still active and releasing neutrons. However, the presence of a viable chlorine source is not known. The neutrons might be reacting… with sea water coming in and out across a crack developed in the containment vessel. A very high 35SO42- activity was observed at [Kawamata, Kashiwa], Tsukuba [175 km from FDNPP], and Tokyo Tech Yokohama [250 km from FDNPP]. Japan is not done damaging itself, the Pacific Ocean and the rest of the planet. The government has given the green light to letting the radioactive water produced on the site flowing into the ocean that will continue raising the threat to life of the Pacific basin on into the future. NHK, Jan 21, 2015 (emphasis added): Regulators approve Fukushima wastewater drainage — Japan’s nuclear regulator has approved a plan by [TEPCO] to drain filtered wastewater from the firm’s crippled Fukushima Daiichi plant into the sea… The firm also plans to reduce the level of radioactive material in the water before releasing it into the nearby Pacific. On Wednesday, the Nuclear Regulation Authority approved TEPCO’s plan to install drainpipes and a pumping system and to reduce the level of radioactive cesium-137 to less than one becquerel per liter. Wall St Journal, Jan 21, 2015: Japan’s nuclear regulator has officially called on [Tepco] to work toward discharging low-level contaminated water… just two days after a worker fell into [a tank] used to store contaminated water… Tepco is using a processing system [that] is unable to take out the tritium [and] is reluctant to release it into the ocean to avoid… criticism from neighboring countries and some nations with a Pacific Ocean coastline… there is no detailed study about tritium’s long-time effect on animal genes. Mamoru Takata, a Kyoto University professor and expert on radiation’s long-term effects, said monitoring would be necessary to detect any worrisome signals. Japan Atomic Energy Agency (pdf), Feb 2014: TOPICS Fukushima — [W]e carried out detailed calculations… for 1,200 radionuclides, and the results were incorporated into a database. Dr. Gordon Edwards, court-certified nuclear expert, Aug 8, 2014 (50:00 in): It can’t be dumped into the ocean, because it’s completely unsafe because of these fission products. They have built over 1,000 large tanks, huge tanks… that contain this very, very radioactively contaminated water. At the moment they’re trying to filter out these fission products… It’s impossible for them to remove all those hundreds of radioactive materials. They know how to remove about 62 of them, but there’s other ones that they cannot. Journal of Geophysical Research: Atmospheres, 2013: An effect of [the Fukushima] disaster was secondary formation of radioactive 35S [...] when neutrons from the partially melted reactor cores activated the coolant sea water. Here we report the first measurements of 35S in sulfate aerosols and rain water collected at [...] Hokkaido, Tsukuba, Kashiwa, Fuchu, Yokohama, and Fukushima, during March-September 2011. [...] Kashiwa site [near Tokyo] shows the highest 35SO42- concentration (6.1 × 10^4 ± 200 atoms/m3) on 1 April 2011 [at] Fukushima would have been 2.8 × 10^5 atoms/m3 during the week after the earthquake [...] Even after 6 months, 35SO42- activity remains very high (9.9 × 10^4 ± 770 atoms/m3) in the marine boundary layer in the Fukushima region, which implies that the reactor core was producing radioactive sulfur. Note that one pico-curie (pCi/m3) is a trillionth of a curie/cubic meter. A very small number. A curie (Ci) is the original term used to describe the amount of radioactive material present or strength of the source. It is based upon the radioactive decay rate of the radionuclide. One curie is equal to 3.7 x 10 10disintegrations (37 trillion decays) per second (dps). So one pico-curie is 37 decays per second. The data on the chart indicates that on March 21st 2011 that Uranium 234 was detected on Kauai with .00019 pico-curies per cubic meter (pCi/m/3); or about one radioactive decay every 2 minutes. 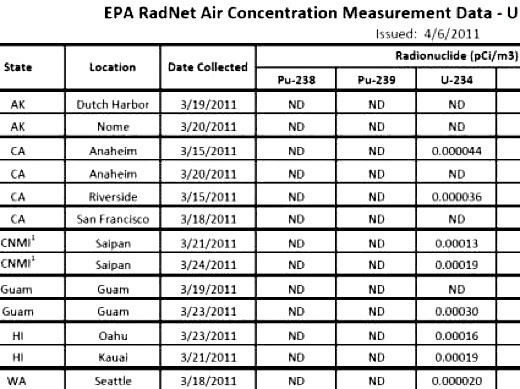 Image above: Detail of chart of locations with values of measured U-234 from late March of 2011from EPA PDF file of report. From original ENE News article). Although the link to the RadNet chart above no longer exists at the link to the EPA website (was it removed? ), I did find this result for Kauai that matches the number (.00019 (pCi/m/3) in that chart (http://oaspub.epa.gov/enviro/erams_query_v2.simple_output?Llocation=City&pStation=0&subloc=KAUAI%2CHI&media=AIR-FILTER&radi=Uranium-234&Fromyear=2011&Toyear=2015&units=Traditional). For doing your own searches go to (http://iaspub.epa.gov/enviro/erams_query_v2.simple_query). You can enter a location and date-range for radiation sampling results (if they have beenperformed). The bottom line is that Uranium 234 was detected on Kauai and reported to the EPA on 3/21/11 that was likely the result of continuing nuclear fission of fuel at Fukushima Daiichi Nuclear Power Plant and being lofted into the atmosphere at a time when sea water was being poured onto uranium and plutonium fuel cores. It is time to admit that nuclear power is a failure that threatens us all. All nuclear power plants must be decommissioned while we have the resources to shut them down. Soon we won't be able to afford to safely shut them off - and then we will have to abandoned forever many more regions than Chernobyl and Fukushima.